There are two crazy things about Avengers: Infinity War – a) the fact that after ten years of buildup it’s finally here, and b) it’s actually worth all the hype and that Marvel managed to fulfill all of your expectations. This is a proper ‘event movie’, a cinema milestone, a new high bar set for theatrical entertainment. It’s everything you wanted and everything you least expected in an Avengers movie. It’s also surprisingly dark and disturbing, so get ready to order some drinks after you watch it. A still from the upcoming Avengers: Infinity War/Image from YouTube. Not much needs to be said about the plot and the heroes in it – chances are, you’re already 20 movies into the sprawling Avengers shared universe and are well aware of what’s been happening and who is descending on Earth once again to destroy the universe. Thanos (Josh Brolin) finally makes his entry after years of teasing, and he means business – and by business he means ultimate death and destruction. Captain America’s Russo brothers have taken over the reigns from Joss Whedon, and surprisingly it seems to have been the right decision. This is a very different Avengers movie – the tone is dripping with noir, the performances are charismatic without the necessity to be cheesy and wise-cracky, and there is a certain ruthlessness in the action that wasn’t seen in the previous installments. There is also the consistent element of surprise, despite the predictable drinking game of 'who’s going to die next' you could play with you buddies as you watch Thanos’ soullessness unfold. But the biggest achievement of the film is the near perfect Yin and Yang balance – where at one moment there’s finely tuned persuasiveness which makes you lean in and emotionally invest yourself in things that are completely ridiculous and almost soap operatic, and at the other there’s perfectly tailored humor to make you laugh even though you were on the verge of crying moments earlier. How the Russos pulled this acceptable method of tonal shifts, that too whilst juggling dozens of central characters is something that needs to be studied with multiple viewings. There’s also a jaw dropping level of visual coherence and clarity in what is an utter typhoon of a script that you would not see coming. And then there’s the action with bone crunching, planet jumping, often visceral set pieces that are so huge it’s hard to believe we’ve come so far ahead in utilising CGI for unbridled entertainment. Stunningly, despite numbing us through the years with multiple movies that end with space ships arriving and NYC skyscrapers crumbling, the action in Avengers: Infinity War feels new. It’s difficult to pick one particular action bit because there’s so much of it in the film you’ll need to watch the film for the second time to truly disseminate which one worked the best. You need to understand that this is a film that juxtaposes the best things about the Avengers and the Guardians of the Galaxy, and delivers by the truckloads. It’s also a shockingly dark and disturbing movie – there are some visuals children are going to be terrified of and parents wondering why this horror movie stuff is happening in an Avengers movie. This is actually a good sign because dark and disturbing needs a mainstream cinema platform to be normalised, and there’s no better method of audience delivery than through one of the biggest cinema franchises of all time. So kudos to Disney and Marvel for having the balls to try something new in an opportunity that they would normally have played it extremely safe. There’s a Greek tragedy narrative strategy that we last saw in Ang Lee’s Hulk film, but it’s executed in a much more efficient and emotionally charged manner by the Russos in Avengers: Infinity War. To answer the question on everyone’s minds – yes, Thanos is finally a great MCU villain, with enough gravitas and villainous arcs to make him interesting and scary. He’s a heavy presence in the film, adding cold sombreness in every scene that he appears in. You expect all the Avengers to do cool sh*t with fancy suits, but for the first time the villain is as interesting, if not more interesting than the Avengers in certain scenes. 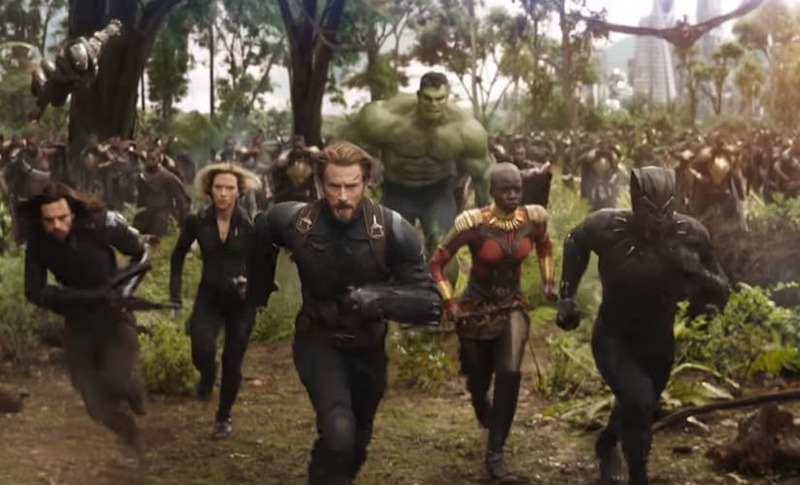 This is also the rare MCU film that understands that bigger is not necessarily better, so even though it offers some of the biggest action sequences of all time, and also a very long running time, every minute of Avengers: Infinity War is packed with energy, urgency and people you somehow seem to give a damn about, who make you fear for their lives. Thanos serves as a metaphorical purge for the MCU slate in itself – kicking off a new chapter in franchise that does away with the weak, cherishes but purges the old and ushers in the new. The final fifteen minutes of Infinity War are pure cinematic mayhem that culminates with a head scratching mystery that only comic book purists will get; it’s going to be a very long wait for next year’s follow up to finally render the closure that we crave after being assaulted on our cinema geek nerves.